BANKS should do more to promote re-employment of older workers, said Tharman Shanmugaratnam, Deputy Prime Minister & Minister for Finance. Singaporeans are by and large healthy in their 60s, and can expect to live longer than before, he said on Friday. Many wish to continue working if possible, and to keep mind and body active, he said. "We have to ensure that older workers who wish to remain meaningfully employed have the chance to do so," said Mr Tharman, who was speaking at the 60th anniversary dinner of the Singapore Bank Employees' Union (SBEU). This has been a major focus for the labour movement, and SBEU has been an active advocate over the years, he said. For example, SBEU managed to get banks to agree to move towards a retirement age of 60 in 1991. This was two years before the law was amended to set it at 60, he said. Through SBEU's efforts, nine banks - covering about three- quarters of SBEU's ordinary membership - now offer re-employment to workers aged 62, up to age 65. The nine banks are OCBC, United Overseas Bank, Standard Chartered, HSBC, Maybank, Bank of America, RHB, Bangkok Bank and Credit Agricole. "They are re-employed on more or less the same terms: in particular, the workers re-employed in the same roles do not see any cut in wages, and continue to receive the same annual increments, variable bonus payments and allowances as their younger counterparts. "They also receive the same annual leave entitlement," he said. "These nine banks value their older workers, and continue to reward them accordingly. They are certainly a positive example for other banks in Singapore," said Mr Tharman. "I want to commend employers for doing their part to recognise the value of older workers," he said. For example, Maybank was recently awarded the Tripartite Alliance for Fair and Progressive Employment Practices Exemplary Employer Award 2014 for its efforts. Although employers are required by law to offer re-employment to eligible employees who turn 62, up to the age of 65, Maybank offers re-employment beyond 65. He revealed that a beneficiary of Maybank's progressive practices is Rita Bok. Ms Bok joined Maybank in 1968 as a bank teller. After 45 years with the bank, she was re-employed when she turned 65 last year, at the same salary level. "Not only that, she was promoted to Special Grade Clerk earlier this year due to her good work performance. Because of her reliability and positive spirit in all that she does, I understand that Rita will be re-employed when she turns 67 next year." Apart from legislation, workers and employers can benefit from the Special Employment Credit and Workfare Training Support, which encourages employers to retain older workers and keep investing in skills even as the workers get older, said Mr Tharman. He also spoke about the challenge of staying resilient through a financial crisis. "Although we experienced job losses in our financial sector with each crisis, we recovered from each crisis stronger and have continued to grow," he said. Today, the sector employs almost 190,000 people, of whom almost three-quarters are Singaporeans. One important factor for this resilience has been a flexible wage system, which SBEU had a hand in negotiating for rank and file workers in the financial sector - first in the late 1980s, and then again in the early 2000s. "It involved painful short-term adjustments but helped to save more jobs which would otherwise have been lost. Crucially, too, over the longer- term, it has given our financial institutions greater resilience and benefited our workers. 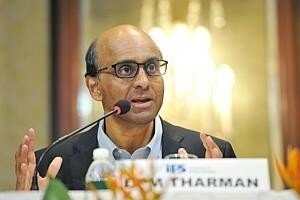 Pay has gone up over time for our rank and file workers in the financial sector," said Mr Tharman. Indeed, they earn about 26 per cent more pay than rank and file workers in other industries. Credit should be given to both the SBEU, for representing its members well, and the industry, for recognising the contributions of its rank and file employees. Bank workers have to stay nimble and keep up with technological changes, he said. "As we have already seen in the last 15 years, there will be more demand for skilled workers and PMEs (Professional, Managerial and Executive job-holders). However, this compositional shift in our workforce does not mean that rank and file workers have no role in the future of the financial sector, or in other sectors," he said.